Make sure to ask right the questions. IF YOU’RE THINKING ABOUT GOING TO COLLEGE, get prepared to do that just. Think, that is. You’re going to be doing a lot of it. From choosing the major that’s going to give you the best career prospects after graduation, to figuring out how you’re going to pay those ever-increasing tuition costs and study-related expenses, to deciding whether or not to go straight into a four-year university or stop by a community college en route, choosing the right university or college experience is more important — with longer-lasting ramifications — than ever before. The days of getting any old bachelor’s degree and being sure to land a high-paying job the day after graduation are long behind this country; for better or worse, the decisions you make regarding your post-secondary education have the power to make or break the rest of your life. With this kind of pressure riding on students, it’s no surprise that many of them have difficulty navigating college admissions, either feeling overwhelmed by the complexity of the process or having no idea where to even begin. That’s why Janet and Paul Marthers decided to create a comprehensive guide for both parents and students contemplating college admissions, entitled: Follow Your Interests to Find the Right College. With years of experience in advising and admissions at various universities between them — Janet has worked in admissions at Oberlin College and Skidmore College, and Paul works in enrollment, financial aid, and student life for the 64 schools in the SUNY system — the duo have compiled everything they’ve learned on the job and through their research to provide a starting point that will set the reader on the right path. With the low-down on nearly every academic disciple under the sun, advice on financing college, and information on some of the nation’s more obscure — but definitely viable — universities, this guide is an indispensable tool for anyone who has college on the mind. 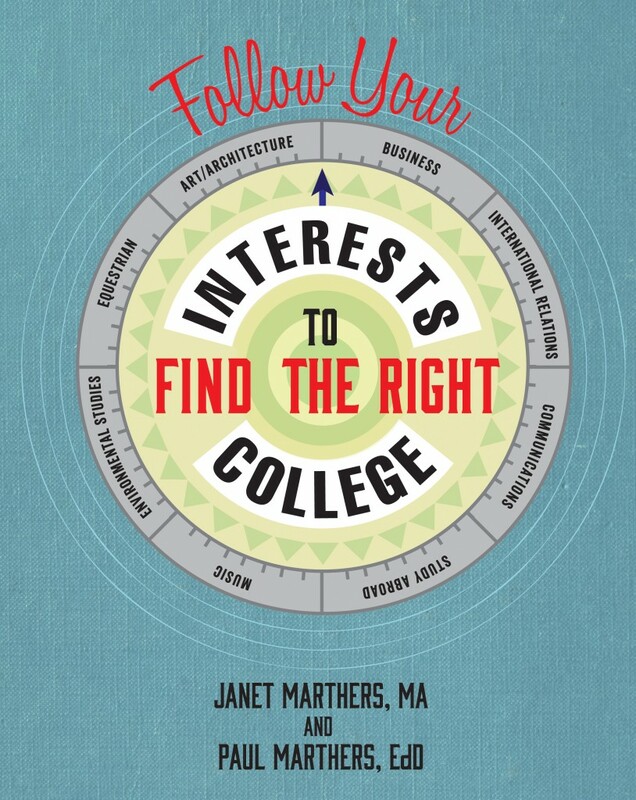 Lady Clever had the opportunity to speak with Janet Marthers about the inspiration behind Follow Your Interests to Find the Right College, the challenges facing college applicants today, and how high schools — and society as a whole — can better prepare students to succeed at the collegiate level. How many years was Follow Your Interests to Find the Right College in the making? Formally, five and a half years of research, writing and revision. Informally, this kind of stuff is a constant conversation that has interested us since we were both high school students researching colleges. We live and breathe colleges and readers benefit from this obsession. There are a lot of guides and information on admission strategy and general profiles of colleges, but neither of us knew of a book that explained the different types of schools and did a serious evaluation of who had the best programs in particular areas. There are many extraordinary opportunities for students, but if they don’t know how and where to find them, they will unfortunately miss out. We want people to be informed, and not miss out on these transformative options. Tell us about your research methods. How did you come to the conclusions you draw in your guide? When possible, we have reached out to professors and administrators who work in the fields highlighted. We also have sifted through a vast amount of information available from the schools themselves, considering reputable rankings — the key word being reputable — and evaluations, fact-checking data and anecdotal information found online, and delving deep into our own knowledge of colleges from years in college admissions and college counseling. We wanted to “reinvent the wheel” in terms of what is currently available (in one place) for college research. Why do you think there’s a need at this specific moment to revamp the way we look at the college application process? There is a lot of fear mongering going on right now that perpetuates a myth of scarcity. Many people think of a small universe of only about 20-25 colleges as legitimate options. Without beginning to count international options, there are over 4000 colleges in the U.S. alone. 2500 of them are 4-year schools, and a lot of them are offering some pretty cool stuff. We need to reframe the conversation about college admissions in terms of abundance. Students and their families shouldn’t always assume that a low acceptance rate is the main indicator of quality. There are a lot of excellent study opportunities out there with varying degrees of admissions selectivity and you should first figure out the places that best serve your needs before turning to strategy on how to get accepted. For example, Harvard is a fantastic school with about a 5% acceptance rate, but if your passion is bears and wildlife biology, the world-class opportunities at the University of Montana in those particular areas, a school with a 94% acceptance rate, are actually much better suited to your needs. What do you think is one of the biggest challenges facing students applying to colleges today? On the surface, our answer would be affordability, but when you dig deeper, the answer is really about language. If you don’t know what the terms mean, you don’t know how to navigate the system. This can be particularly heartbreaking with financial aid issues. If people don’t know the questions to ask, then they may turn away from fantastic options because they assume they will not be affordable. The more you know about different types of colleges and how they make it possible for people to afford them, the better choices you can make about your future. It is often the most expensive colleges that can afford to be the most generous in terms of financial aid. In any event, it pays to be an informed consumer, and knowing the vernacular helps you ask better questions, which will hopefully lead to better answers. What do you think is the biggest challenge for female students applying to colleges, specifically? There is a surplus of fabulous young women applying to certain colleges, and despite being well-qualified, they can’t all be accepted if the college wants to create a somewhat-balanced gender ratio in their freshman class. Fortunately, there are so many great schools, that chances are, if you are denied admission to a particular school because the pool of women is stronger than the pool of men, you will still win out at other schools. This is not an issue at all colleges, and it is important to keep in mind that certain tech schools and military academies have applicant pools that are largely male, and the tables are turned. What do you think high schools are doing wrong when it comes to preparing students for college? What about society? Where can we improve? It is so hard to generalize, because there are a many high schools who do it right. Yet, many school districts don’t recognize that a college counselor is very different than a guidance counselor. There are some guidance counselors who are interested in college planning, but their training and background is actually quite different than someone who is specifically a college counselor. Usually the higher-education knowledge base of a guidance counselor is limited, and their jobs deal with many urgent student issues that have nothing to do with the nuanced differences of separating one college program from another. Schools need to stop dumping college counseling onto general guidance counselors and dedicate money for hiring college guidance staff who make college selection and applications their priority. Why is Follow Your Interests to Find the Right College an important tool for college-bound students? It helps people understand different types of schools, as well as concisely providing information on excellent programs in given subjects or interest areas. We also clarify a lot of information for transfer students and home-schooled students, as well as demystify financial aid. Our book is the only place you can find this much information collected, synthesized, and distilled in a single location. If you could distill your guide into one piece of advice for college-bound students, what would it be? There are a lot of high-quality choices out there, and getting to know yourself on an academic and extracurricular level will be the best way to identify the ideal options for you. Once you know what some of those interests are, the book directs you to amazing options you probably hadn’t heard about, and will likely be very glad you have now. If you’re interested in broadening your horizons when it comes to the college application process, or know someone who might benefit from this information, grab a copy of Follow Your Interests to Find the Right College here.